What does a Scots cook do with all the potatoes, meat, and leftovers from the Sunday roast? Throws them all into a pot and makes stovies, of course! This dish is said to have originated in the time when masters would give their servants the food left over from the Sunday lunch. Servants would take the leftovers home and make them into an easy-to-cook dish that could last them all week. 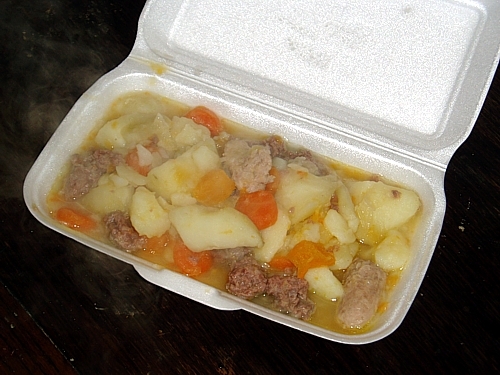 The name "stovies" comes from the French etuve, meaning "to cook in its own juices." 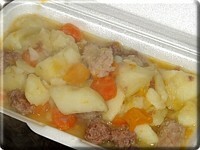 There are several variations to this hodge-podge of a dish, most of which include potatoes, onions, and beef, although other vegetables can be added, and chicken, lamb, or corned beef can be substituted for the meat. Stovies is best enjoyed with oatcakes. The following recipe comes from RampantScotland.com and serves four.